Axe Cop and Avocado Soldier were told by their dog to help Leaf Man get his powers back after they had been stolen from him by Bad Santa and an Evil Flying Book. It took adding four additional heroes to their team to finally defeat Bad Santa and the Evil Flying Book, but in the end they never did get Leaf Man's powers back, so Avocado Soldier just gave them back to him using his unicorn magic. powers: leaves. Mr. Stocker is a super hero with no powers who was summoned by Uni-Man in the battle with the Tiny Robots Who Want to Bite People. 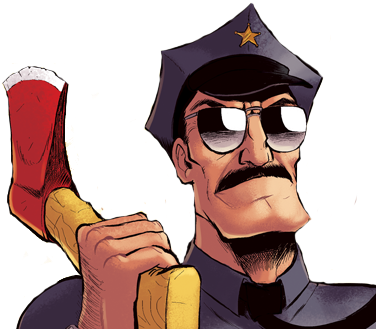 Stocker is one of the briefest characters in the Axe Cop universe, having been immediately bitten and transformed into a tiny robot one second after he appeared. powers: none. The Wrestler joined the team at a try out to help Leaf Man get his powers back from Bad Santa and the Evil Flying Book. His moment of glory was when he tossed Uni-man into the the Evil Flying Book and destroyed it. powers: he's a wrestler.